Since last year, when we had decided we were going to visit Japan, I have been excited to visit Tokyo Disney. I think it was in our trip budget before the Kilimanjaro climb was. So it was no wonder that I couldn’t sleep the night before we went- I was like a kid on Christmas Eve! We originally thought we would go to Tokyo Disneyland, but after a little more research, we decided to go to the other park in Japan: Tokyo Disneysea. And it was awesome! For you Disney World people, it was like MGM Studios meets Epcot, and for my So. Cal friends, it was similar to California Adventure. After over an hour on the commuter trains from our Airbnb in Tokyo, we arrived! And our day ended up being more of a cultural experience than anything else- but magical just the same! 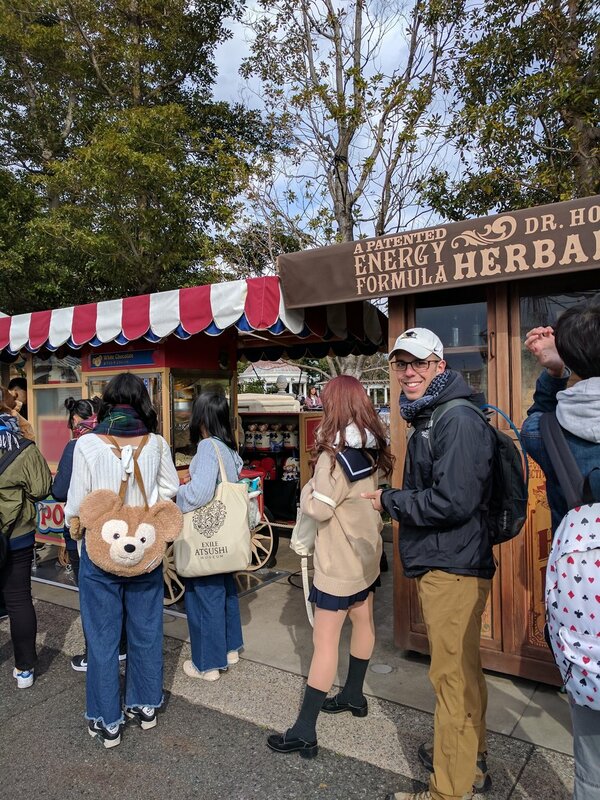 Anyway, visiting Disneysea taught us so much about Japanese Disney culture. Everything in the parks are a photo op for you and your friends! And I’m not talking about taking pictures with the characters. There were long lines formed around the park to take pictures with the scenery. It seemed like they specifically designed the park to have random photogenic backdrops (more than in any other park I’ve seen!). This was seriously impressive. And helpful! Since Jeff and I were two, of the maybe ten westerners we saw at the park, it helped us know who was with whom. 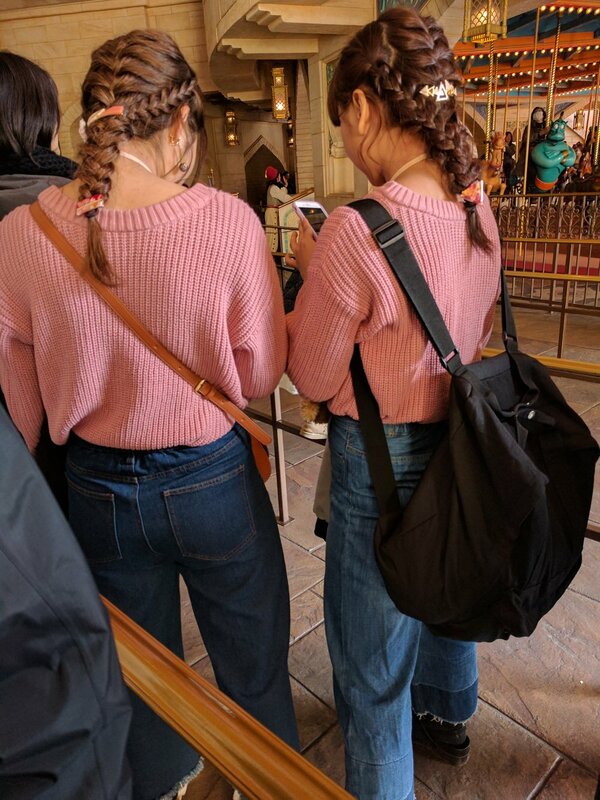 Instead of accidentally splitting up a group of teeny-boppers going into a show, we would just look at who was standing in front of us, and if the people behind us were wearing the same outfit, we knew we were standing in the middle of their group! Jeff and I froze our butts off all day (I was wearing 2 pairs of pants and was still chilly), but most of the girls were running around in short skirts. The people watching was phenomenal, and fun fact: fishnets seem to be making a strong comeback! Souvenirs in the park were ungodly expensive, just like at home. People were going nuts in the shops right when the park opened! I just wonder where they keep all of their souvenirs…most of the homes and apartments in Japan are smaller than tiny homes. But what was pleasantly surprising was that most of the food was reasonable! And tasted good! 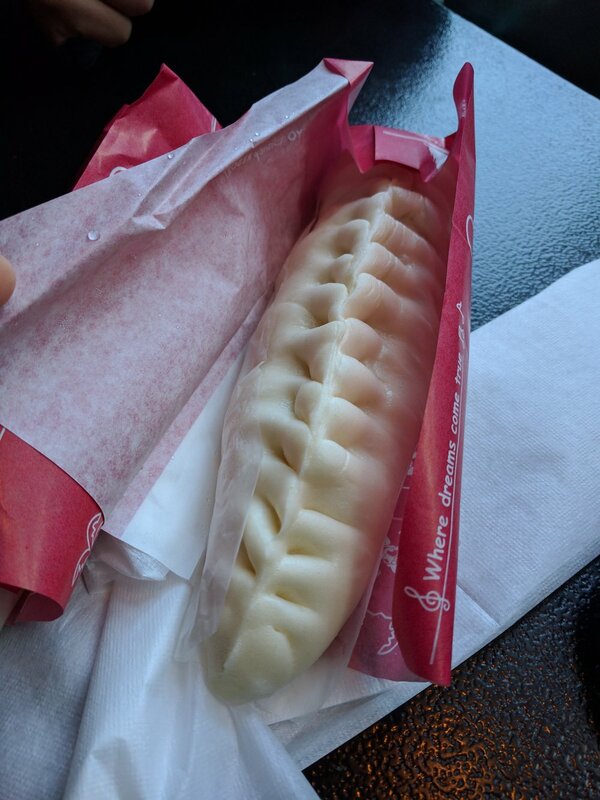 We could buy steamed buns in the park for 500 Yen (just under $5), and that was what we would buy them on the street for! Popcorn is extremely popular here, and everyone was walking around with souvenir popcorn holders hanging from their necks. With 7 different flavors, we had to try some! We opted for white chocolate and black pepper (not at the same time). Flavors change with the seasons here, but others available included: caramel, salted, cappuccino, curry, and milk chocolate. Whenever my family goes to Disney, we always get Mickey Ears- the klondike bar in the shape of Mickey's ears stuck on a popsicle stick. Even though it was a cold day, we were on the search for ice cream! I was a little disappointed when we found limited ice cream options. We settled for a tiramisu ice cream sandwich since the only other options were popsicles or a vanilla ice cream bar. It didn't even come close to Mickey Ears, so later we just ate more popcorn! 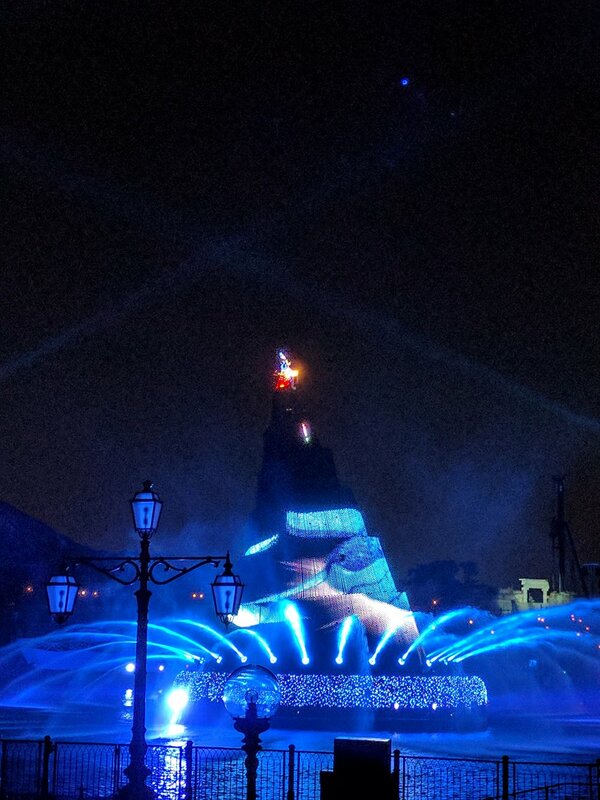 We stayed until the park closed, and caught the last show of the night with Mickey. 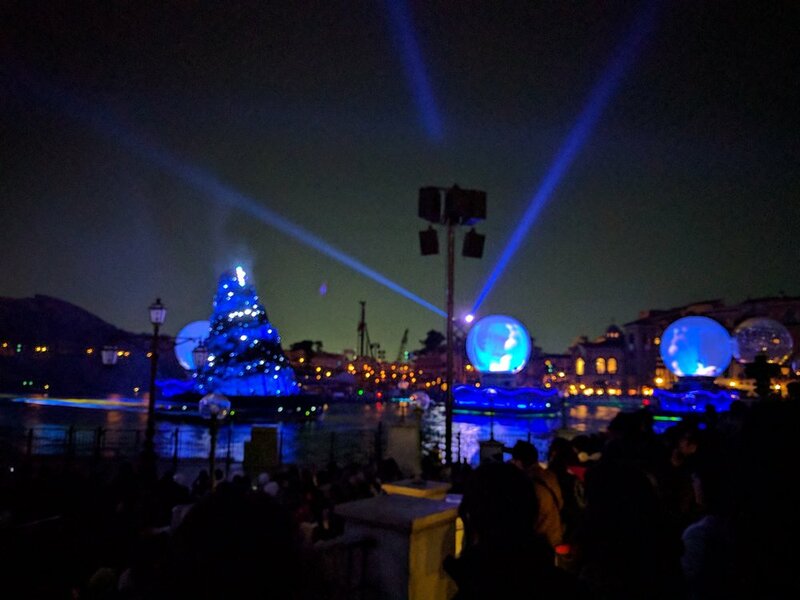 Disneysea is mostly around a huge manmade lake (hence Epcot), so there were a ton of lights, pyrotechnics and water spraying everywhere! 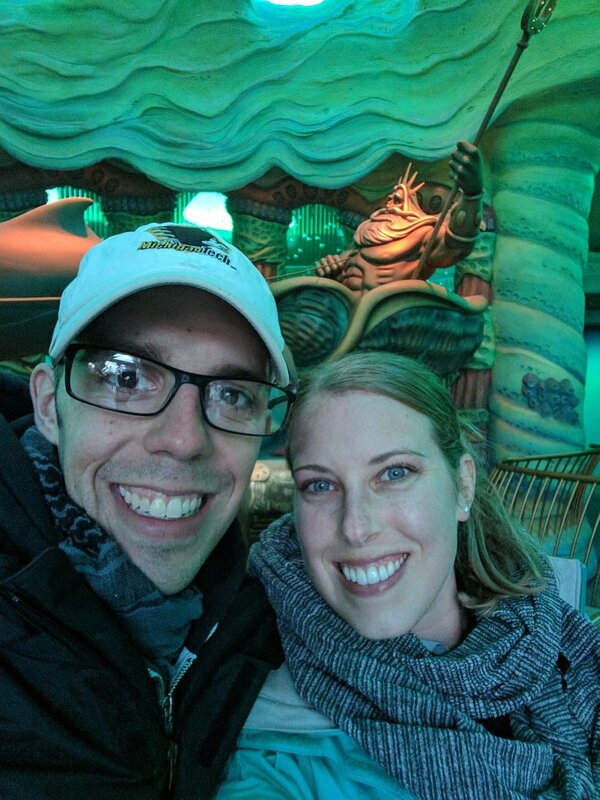 We had a magical time that didn’t break the bank. We spent just under $190 for the whole day, including park tickets, food and train tickets to get there and back from our place in Tokyo!